US PORTS: Congressional spending bill doubles funding for the Maritime Administration. Omnibus spending bill triples funding for TIGER infrastructure grants. Omnibus spending bill raises by $1 billion funding for surface transportation programs. Omnibus spending bill includes an increase of $789 million for the US Army Corps of Engineers. US members of the American Association of Port Authorities (AAPA) have increased confidence their key priorities will be addressed after passage of an omnibus spending package to fund the federal government through September 30, 2018. The spending bill, which President Donald Trump signed on Friday, contains funding for a number of AAPA’s top infrastructure and intermodal priorities, both on the landside and the waterside. On the landside, the omnibus triples funding for the Transportation Investment Generating Economic Recovery (TIGER) discretionary, multimodal infrastructure grant program to $1.5 billion, up from $500 million in fiscal 2017, with 30 percent dedicated to rural communities to reflect the President’s priority for rural infrastructure. The bill also raises by $1 billion, to $45 billion, funding in fiscal 2018 from the Highway Trust Fund for the US Department of Transportation’s Federal Highway Administration (FHA) surface transportation program. The funding mirrors the FAST Act-authorized levels and provides an extra $2.5 billion in discretionary highway funding, for a total of $3.5 billion for surface transportation (roads, bridges and tunnels) over fiscal 2017 appropriation levels. On the waterside, the bill includes $6.83 billion for the US Army Corps of Engineers, an increase of $789 million from fiscal 2017. The bill funds the Corps’ navigation program at $3 billion, with $123 million for General Investigations, $2.085 billion for Construction General, and $200 million for the Corps’ regulatory program. The Corps’ Operations and Maintenance program, which pays for crucial maintenance dredging in America’s deep-draft harbors and channels, is funded at $3.63 billion, with $1.4 billion coming from the Harbor Maintenance Trust Fund (HMTF), an increase of $100 million over last year’s appropriation. The bill also requires the administration include six new studies and five new construction starts in the Corps work plan. 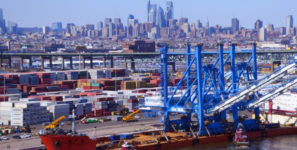 The omnibus bill provides level funding at $100 million for the Port Security Grant Program, which allows strategic investments to support maritime transportation infrastructure security activities throughout the US. Customs and Border Protection (CBP) will receive $14 million, a nearly 15 percent increase over fiscal 2017, in which $7.6 million will be used to hire 328 new CBP officers. A $15 million increase, to $75 million, of the Diesel Emissions Reduction Act (DERA) is also included in the legislation. DERA provides grants to eligible entities, including ports, for projects that reduce emissions from existing diesel engines. It also provides $980 million for the US Maritime Administration (MARAD), an increase of $457 million over fiscal 2017 appropriations, which will help raise the productivity, efficiency, and safety of the nation’s ports and intermodal transportation system. Among the MARAD programs important to ports is its Marine Highways program, which is allocated $7 million for fiscal 2018, up from the $5 million appropriated last year. AAPA President and CEO Kurt Nagle remarked that the new spending legislation reflects the association’s priorities for improving the “oftentimes overwhelmed, antiquated and deteriorating transportation links with America’s ports,” and represents the first step by Congress to favorably respond to the president’s infrastructure priorities.